So I had the unique opportunity to get Open Water SCUBA Dive Certified...Yep that pretty much means I can be a Navy Seal now (that might be a bit of an exaggeration). The open water certification is pretty much the basic certification, so really I am no where near being a Navy Seal (so disappointing). It was a bit of a bumpy road, I ran into a few issues. But it was tons of fun. And I got a super awesome super painful sunburn on my back. Yep it definitely bumped....to much information??? 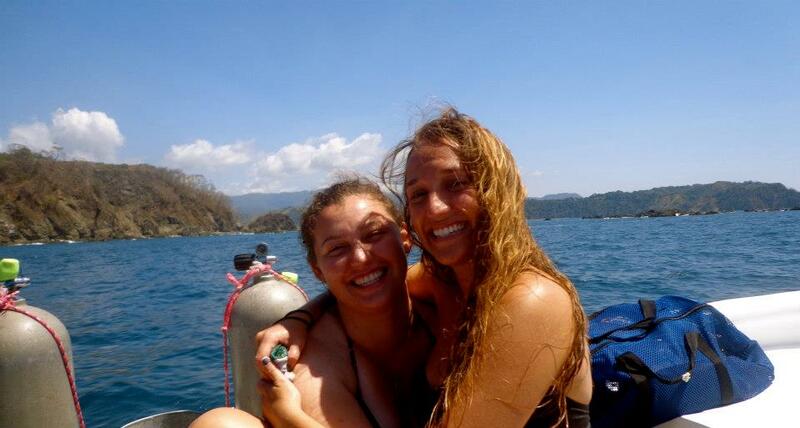 This Christy and i on the boat during a break in between dives. Here is the group of us who got certified that weekend. Well except for me. I ended up having serious problems with my frontal sinuses that prevented me from diving. It was probably the worst pain I have ever felt. 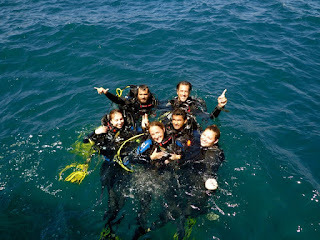 We were suppose to do the last two dives of our certification that day. I tried both times but had to come out of the water after only going down a few feet because the pressure was just too much for me to handle. Here is our group Becky, me, Christy, Aki, Alejandro, and Hari. 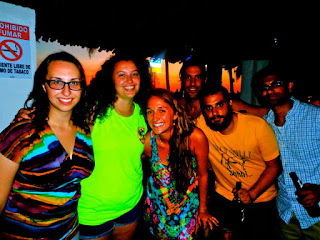 This was on Saturday night after we had finished diving and spent some time at the beach. We stopped at the bar to get a drink before dinner. Becky met a really cute Peruvian surfer here. Also the totally awesome neon shirt I am wearing is ironically enough an imperial beer shirt. So it has a huge beer logo on the back and front. I just liked the fact that it was neon green. But good thing you pretty much can't loose me while I have it on. I have been wearing my hair down a lot here. Pretty much cause there isn't much else to do with it besides wearing it down, in a bun or in a braid. 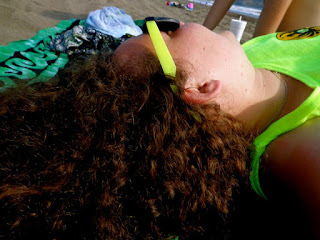 And Christy was pretty obsessed with my curls at the beach so she took a bunch of really random/awkward photos of my hair. Yep AWKWARD. This is one of them. So since I wasn't able to get certified with this little gem of a group I went the following weekend with a different group of kids from UPEACE. And lets just say that they were a little less coordinated. Which means I definitely got hit in the head with a tank about five different times. And that isn't fun, neither is getting kicked in the face by a fin. But in the end. 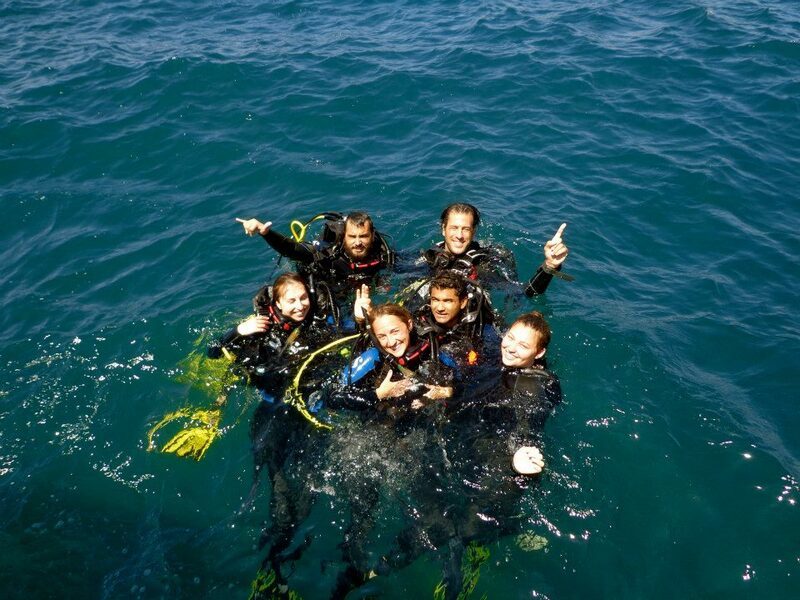 I am now a certified open water SCUBA diver. What does that mean?? Well one I am super cool, yep you can be jealous. And two if i was super adventurous i could go SCUBA diving by myself in the open water, not going to happen. But it does mean that there are many more dive adventures ahead. One of them I will be sharing with you very soon!!! P.S. all of these pictures are from Christy's camera, cause she was way more adventurous than me and took her camera on the boat.